For Costume College's Gala event, I'm doing early 19th century court attire: an open robe and gown, I'm fondly terming 'Bees, bees, bees'! 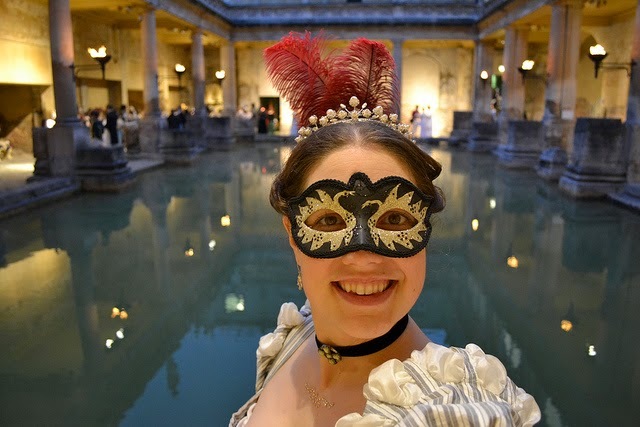 I am making a Regency court robe (open robe) and a Regency court gown. I decided to follow Kat's advise and use Butterick #4890 to make the court robe (she made a gorgeous version of this at the end of last year for the Regency Baltimore Harbor weekend), and then I plan to use the La Mode Bagatelle gown pattern as a base to make the Regency court gown. 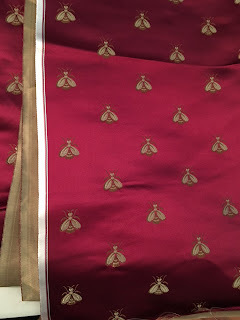 I found a gorgeous silk bee fabric recently online that I'm using for the court robe, it was listed as silk shantung, but it's silk brocade: it ravels like crazy but it's very luxurious, I feel very spoiled and I'm loving working with it. It was way more than I ever pay for silk (I like super deals) especially for a non-wide 30" yard! 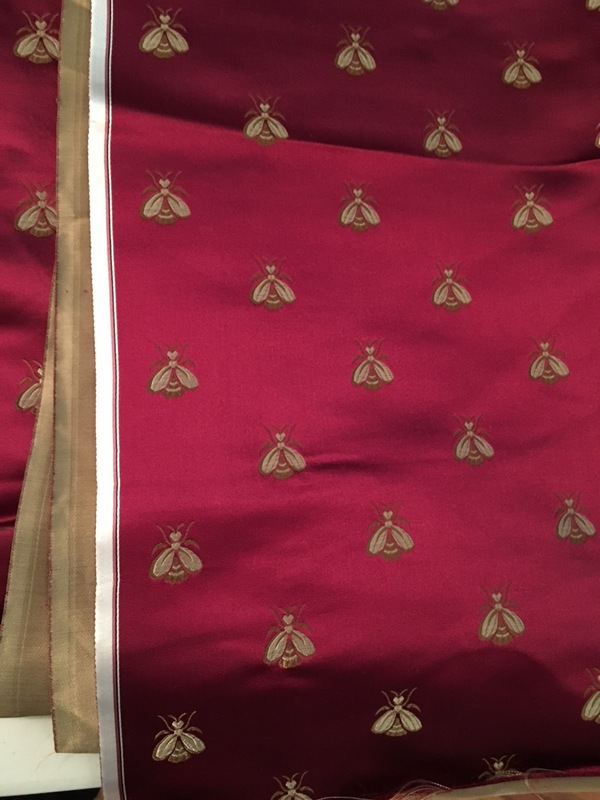 But...it's really hard to find great silk Napoleonic bee fabric on super deal, so I just couldn't resist when I found this lovely Napoleonic bee burgundy silk brocade with gold bees: YUM! 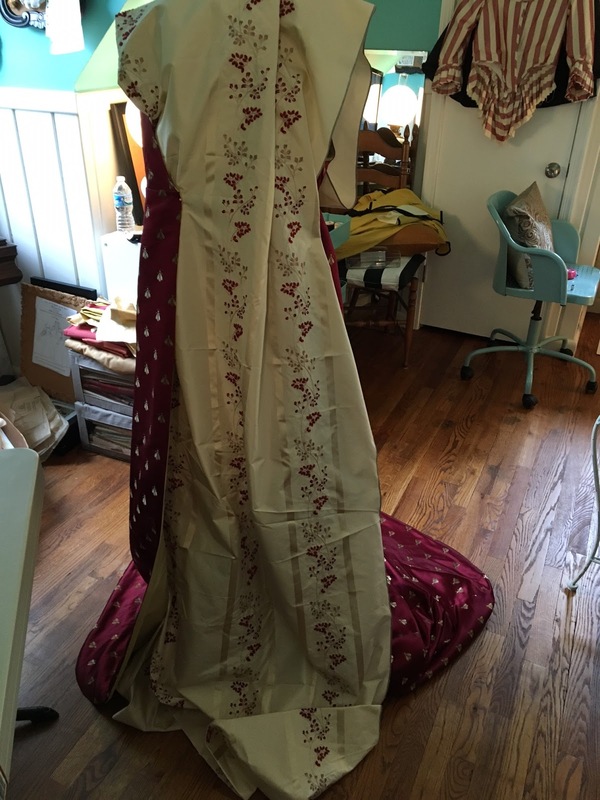 I also have 4 yards of a gorgeous embroidered silk taffeta I picked up in the Fashion District about 5 years ago: cream with tiny red & cream flowers, that I am using for the court gown itself. It was always intended for a Regency so it's being used for its original purpose (win win!). I had a few days off recently so I was able to a decent bit of sewing in: so far I have the bee court robe all together, minus the final belt and the little gold trim I am planning for the edges. I have the court gown fabric laid out, but I don't have quite enough for my La Mode Bagatelle pattern pieces (I'm about a half yard short), so I'm going to have to be creative and figure out how to get it out of the fabric I have: a coordinating hidden back panel (but if I do, I can't really wear the court gown without the court robe), or add a different hem, another fabric for the top or just a bunch of piecing. Once I figure out what I want to do, I'll be full steam ahead on the court gown! I've been wanting to make a Regency court outfit, gown or robe with bee fabric ever since I began costuming. I have been on the lookout for great fabric for the last few years for this project, and occasionally pick up a bit of silk bee fabric at a sale price, but generally it's hard to find and expensive: so while I have acquired some and even made a bee muff a few years ago (and have some other bee fabric on hand to make up at some point, it wasn't quite what I was looking for, for this project though), until I recently found the PERFECT bee fabric for this plan, so I decided it was time to get this early 19th century court outfit going finally. I'm an 'inspired by' rather than an exact copy costumer: the train on the original is too long for my super narrow fabric (there just wasn't enough of it: I COULD have gone a little longer and wider, but Kat made up the Butterick trained open robe already and it's gorgeous, so I knew I didn't need to go longer, plus now with the yards I have remaining, I should be able to get a spencer, muff, reticule & bonnet out of it hopefully! We'll see what I can get with careful cutting and piecing ;)). 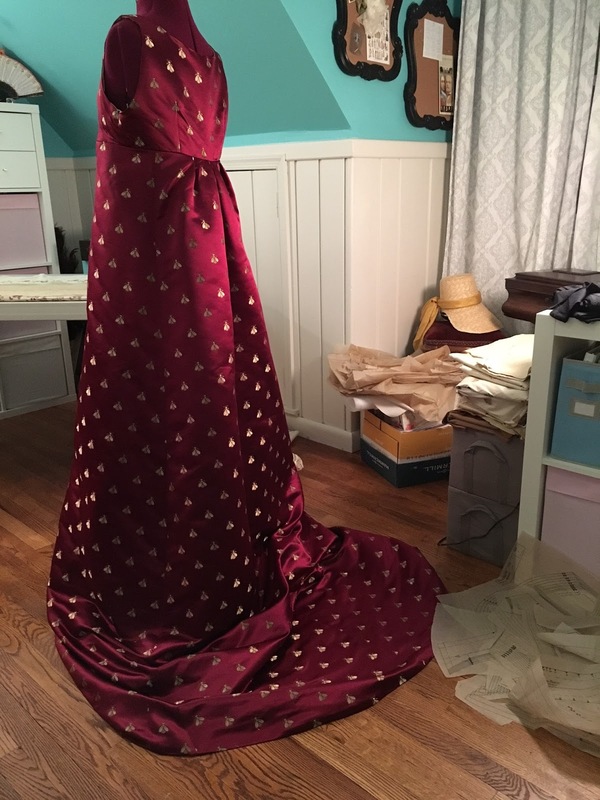 I cut the fabric out for the open robe very carefully, and I'm going to try to get a spencer, bonnet, reticule (and maybe muff) out of the remaining yardage: I going to line it with mustard yellow silk taffeta. If I can get these done for CoCo, I will wear them with my yellow cross over gown. I find it inspiring how often ideas can be YEARS in the making, but then they finally come together one day!